Jeff Humphrey (far right) and his son Jack (next to him) round up used baseball gear for kids in need. Roscoe Bryant founded the Oakland Royals, a kids' baseball team in West Oakland's Ghost Town neighborhood, after a fifteen-year-old boy was killed by gunfire in his front yard. Bent on getting neighborhood kids off the street, Bryant quickly rounded up enough boys to field a team, but then ran into a logistical problem: Baseball is expensive. Unlike other sports that require nothing more than a ball and a buddy to play, baseball teams need a laundry list of pricey gear — hats, bats, cleats, helmets, gloves, and catchers' equipment. Bryant scraped together what he could by scouring local Salvation Army and Goodwill stores; the team played its first games with only six gloves. "We just hoped it didn't get hit to the outfield," Bryant said. But now, seven years later, the Royals are fielding five teams with 75 kids, ranging from five-year-old tee-ballers to 15-year-old budding stars. The program's growth is a reflection of Bryant's commitment, but he insists that it would be nearly impossible if he weren't receiving hundreds of dollars of used equipment from a Robin Hood-type figure in the East Bay baseball community — Jeff Humphrey. "Eighty to ninety percent of the equipment we have comes through Jeff," Bryant said. "Without him, we don't play ball; I might be able to field one team." The considerable cost of fielding a baseball team is one reason why so many young urban athletes have turned to other sports. Of course, there are myriad other reasons for this trend — the rise of basketball and football as major TV sports, the constant motion and instant gratification of those games, a lack of recruiting by college baseball, and a big-league scouting shift from inner cities to Latin America. But the combination of costs and these other factors has resulted in a sharp decline in the number of inner-city youth — especially African Americans — playing baseball at every level. It shows up in the big leagues, too. This season, only 8.5 percent of major-league ballplayers on opening-day rosters were black, down from a high of 27 percent in 1975. Even here in the East Bay, which has one of the country's richest traditions of producing African-American talent — Hall of Famers like Frank Robinson, Willie Stargell, Joe Morgan, and Rickey Henderson, to name a few — the number of kids signing up to play youth ball in Oakland, San Pablo, and Richmond has dropped by the hundreds since the mid-Eighties. The cost of playing baseball is an enormous obstacle for parents and coaches in economically deprived neighborhoods like Ghost Town. That's why former Cal batting coach Oscar Miller started collecting used gear from kids who attended his instructional clinics six years ago. "It all started with Oscar Miller's dream to get gear back to West Oakland where he grew up," said Humphrey. On a day in 2005, Humphrey was driving his eleven-year-old son Jack to Miller's summer camp with a friend who was carrying two extra pairs of cleats. That's when Humphrey learned about Miller's desire to round up used gear for kids in West Oakland. As someone who'd coached more than twenty youth teams in Oakland, Piedmont, and Walnut Creek, Humphrey figured he'd make a couple of calls, send out a few e-mails, see if he could help. One of the people Humphrey contacted was Tom Leserman, softball commissioner of the Lafayette/Moraga Youth Association, and it just so happened that the organization was about to discontinue its baseball programs for kids older than ten years of age. "We had all this surplus equipment just sitting in our shed," Leserman said. So, he loaded up Humphrey's truck with twelve-dozen sets of unused catchers' gear, bats, gloves, uniforms, and equipment bags. "He put so much gear in my truck, I had to immediately go to Orchard Hardware to buy 150 feet of rope just to tie it in," Humphrey recalled. Soon, more gear started piling in from leagues across the East Bay — Albany, Alameda, Oakland, Piedmont, and Walnut Creek. In just a few weeks, Humphrey rounded up seven truckloads of equipment, including more than three hundred bats, three hundred sets of cleats, numerous helmets and gloves — anything a young ballplayer could possibly need. "Jeff e-mailed me to see if we were interested," said Ron Matthews, president of Alameda Little League. "I said, 'Hell yes.' We were already recycling this stuff, but this was a more organized concept." They laid the gear out in Miller's backyard and invited about fifty West Oakland kids over to grab whatever they wanted. It was almost too easy, and Humphrey noticed a trend: Most of the leagues had so much equipment he couldn't take it off their hands fast enough. "The common phrase was, 'Bring a truck,'" he said. Then it clicked: How many other leagues are just stuffing their gear into sheds? Humphrey said he scratched up a "hokey" flier and passed it around the baseball community. He didn't give the drive a name or a catchy slogan; instead he relayed a simple message: "Tell a friend." 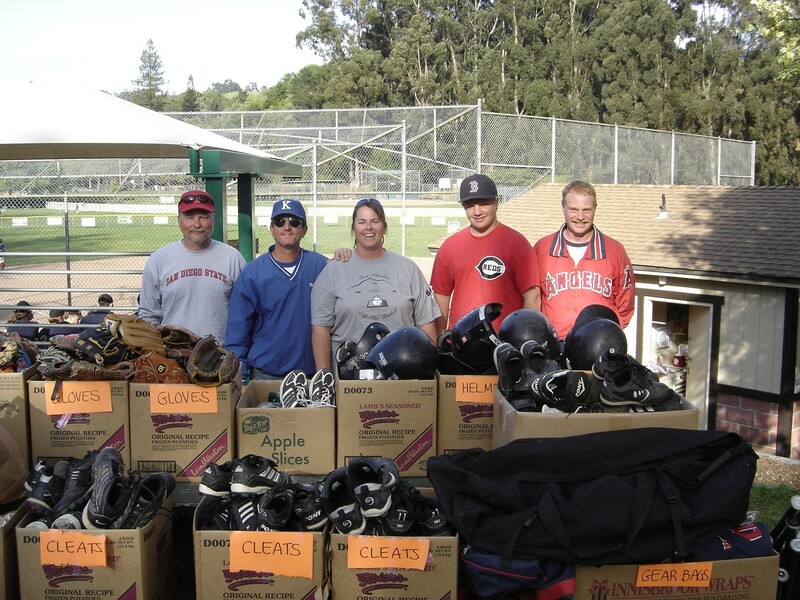 It didn't take long before gear starting pouring in from all over the place: Teams and little leagues in El Cerrito, Livermore, Burlingame, Hillsborough, and Marin County started giving away their used stuff; Berkeley High, Northgate, Bishop O'Dowd, and Head Royce donated equipment for teenagers; Total Sports in Dublin offered up 1,300 pairs of pants that outfitted five teams; Triple Play Batting Cages in San Leandro gave away used bats; Oakland A's radio announcer Ken Korach provided several boxes of baseballs and Mizuno USA supplied 125 pairs of brand-new cleats. Humphrey's boss, Ken Nitzberg, at Devon Self-Storage in Oakland, even wrote a check for $500 so that Roscoe Bryant could build a batting cage in his backyard. "It's the centerpiece of the neighborhood," Bryant said proudly. "It gives the kids something to do when we're not playing." 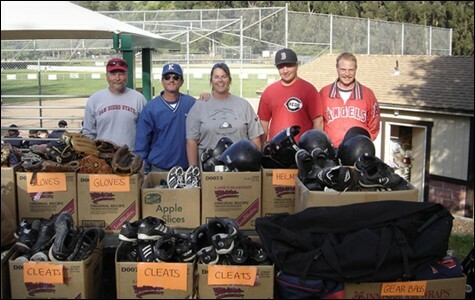 Meanwhile, many leagues, like Alameda, Albany, and Burlingame, started holding gear collection drives so that parents could donate outgrown equipment rather than shoving it a box. "Jeff makes it easy for us," said Jack Miller, president of Albany Little League, whom Humphrey calls, "the backbone of the whole thing." "People want to do the right thing, but the easier you make it for them the more likely it's going to get done." Humphrey's son Jack, now a teenager, accompanies him on almost every run; many in the baseball community refer to them as the "Blue Truck Boys." "I know how cool it is to get a new baseball bat," Jack Humphrey said. "To see their eyes light up — they're on top of the world." In six years, Humphrey has delivered 24 truckloads of gear to 1,000 kids playing for about forty teams in West Oakland, San Pablo, Richmond, Vallejo, Rodeo, and East Palo Alto. "Jeff gives us anything we need," said Bob Forman, president of the San Pablo Baseball Association. Like Bryant in Oakland, Forman's biggest challenge is financing everything a healthy baseball league requires: $300 per bat, $100 per glove, $35 per helmet, $150 for catchers' gear, $50 for cleats, $22.50 for a box of baseballs, and that doesn't include uniforms, equipment bags, chalk, umpires' fees, and field maintenance. In a suburban league like San Ramon Valley, registration fees run up to $350 to cover these expenses, but most parents in San Pablo and Richmond can't fork over that kind of money. "A lot of families in our area don't have the funds for their kids to play, so I have to say, 'Okay, just give me $10 or $20,'" Forman said. He estimates that Humphrey's gear saves him $700 to $800 annually, not to mention the countless hours he'd have to spend hustling to make ends meet.But other benefits are immeasurable; in a child's eyes, every piece of equipment is a gift. Forman lets his players take their bats, gloves, and catchers' gear home so they can practice with it and make something they treasure. "Kids feel special when they have their own stuff. A lot of these kids have never even had a glove," Forman said. "Jeff's a hero in my book." But the modest Humphrey doesn't think his role should be blown out of proportion; he views himself as a middleman. The real heroics, he says, are performed by guys like Forman and Bryant, who devote themselves to giving kids a better chance in life. "I'm just a conduit between the people who have used gear they don't want to throw away and the kids who need it to play baseball," Humphrey said. He said his motivation isn't about increasing the number of African Americans in Major League Baseball. His goals are more modest, yet more meaningful: He thinks sports can boost a kid's self-esteem while instilling values of teamwork, sportsmanship, and perseverance. Humphrey also wants to spread the joy of playing a kid's game. "You're only young once," he said. "It's really about giving more kids a chance to have memories of playing the great game of baseball."